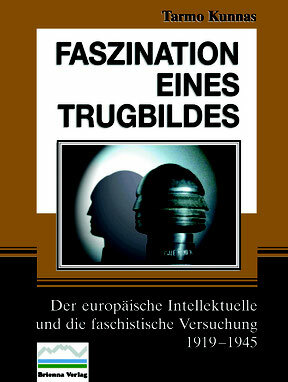 Faszination eines Trugbildes (The Fascination of an Illusion) by Tarmo Kunnas is an unusual book in several respects. It sets out to examine what in the subtitle to the book is described as “the European intellectual and the fascist temptation, 1919-1945.”“Here,” Kunnas explains, “the tragedy of fascism is seen through the opera glasses of the person it has captivated, and my book for its part is intended to complete a picture of the fascist movements.” (p. 9) In his Foreword, Kunnas tells us that his book deals with the relationship of more than seventy European intellectuals from fifteen nations who were “tempted” by fascism. The writer is Finnish, and this lengthy work of over seven hundred pages was first published in Finnish as Fasismin Lumous (The Enchantment of Fascism) in 2013, translated into German, and published by Brienna Verlag, a small, Right-wing German language publishing house, in 2017. Two works on Friedrich Nietzsche by Kunnas have previously been published by the same imprint. Indeed, Kunnas has had several of his works published in French and German, and yet there has been nothing to date in English. Is the potential interest in the subject reckoned to be so low among the potentially much larger Anglophone readership? The translation under review was subsidized by a body called the Finnish Literature Exchange, a non-profit organization which helps Finnish writers by bearing some of the costs of translating, printing, and publishing their works in other languages. It is interesting that this book has so far found no English-language publishing house willing to take on the commercial risk of issuing such a wide-ranging study of fascist thinkers. The German title of Kunnas’ book raises a question. The word Trugbild has a mainly negative connotation in German. A more obvious translation, assuming the online dictionary translations of lumous are correct and correspond to the Latin root, might be “illusion,” or Täuschung in German; lumous can apparently also mean something like “chimera,” “illusionary dream,” or “delusion”; likewise “charm,” “spell,” or “dream.” There is a considerable difference between the fascination of a charm and the fascination of an illusion. This is not quibbling, for while Kunnas is well-focussed when he examines and quotes the political statements of the many writers he considers here, he is (deliberately?) ambiguous when it comes to his own approbation or otherwise of “fascist temptation.” Calling this work Trugbild tilts it in the direction of a negative interpretation. In this book, Kunnas seeks to provide a wide-ranging overview of the writings of creative writers and philosophers in the inter-war years who felt attracted in at least some respects to fascism. They include Gottfried Benn, Robert Brasillach, Louis-Ferdinand Céline, Hanns Johst, José Antonio Primo de Rivera, Alphonse de Chateaubriant, Emil Cioran, Wyndham Lewis, Filippo Marinetti, Örnulf Tigerstedt, Knut Hamsun, Martin Heidegger, and many more. There are, perhaps inevitably, omissions likely to surprise: D. H. Lawrence, T. S. Eliot, and Evelyn Waugh receive hardly a mention. While Scandinavian countries are well-covered, as is to be expected, with the exception of Romania, Central European writers hardly feature at all. This is probably owing to Kunnas’ personal familiarity with Scandinavian writers and his ignorance of Central European languages, but it creates doubt as to whether this work constitutes a balanced assessment. Did Hungary and Bulgaria have no intellectuals of note to merit inclusion? In his Foreword, Kunnas says his objective is to examine “why fascism in the inter-war years held such attraction for the European intelligentsia and on the people of the time.” In fact, this study does not look at the attraction fascism held for people in general; it focuses exclusively on writers. The organization of the book is unusual. Instead of covering his ground with chapters devoted to specific writers or nations, Kunnas works through chapters which revolve around given themes, and then scrutinizes in each an array of writers in relation to its theme. Here are the titles of a few of the many chapters: “Exactness is not Truth,” “Mistrust of the Good in People,” “Social Darwinism,” “Puritanism,” “The Weakness of Parliamentarianism,” and “Against Faith in Progress.” For each of these, Kunnas provides the reader with an abundance of examples of how, within the perspective of the given theme, many intellectuals inclined towards fascism and a fascist solution, or towards an interpretation of the theme. This unusual approach has the advantage that it shifts focus from a biographical account to a philosophical and theoretical one so that the reader is compelled to think about the matter at hand firstly, and about the writers and thinkers drawn to it secondly; that is to say, he looks at the subject in respect of the theme itself and how fascist thinkers and fascist thought approached and evaluated each given theme. This is an original alternative to the standard presentation in critical assessments of the relation of writers to certain themes, as in potted biographies and the organization of such books into the intellectual, political, and literary career of one writer per chapter. Jünger’s thought was free from the race-mysticism of the National Socialists, and even as a nationalist, he was open to outside influences. In this respect, he was closer to young Italian Fascists than to his National Socialist compatriots. It is a historical paradox that those very young Italians had lifted their battle cry against Jünger’s fatherland. There was no question of inter-fascist solidarity then. The last remark in this example is provided with a reference to Hans Grimm’s work. This brings me to another unusual feature of this book, one in which I see no advantage. Instead of reference numbers taking the reader to the name of the work and page number cited as is customary, the reader is taken to a name and date – in this case not Grimm, but someone called Gümbel, and from there to another number, which is the page number from which the quotation is taken in Gümbel’s work, listed under another index of writers. Finally, the patient reader will discover that the quotation is from page 115 of a work by Annette Gümbel that was published in Darmstadt in 2003 by the Hesse Historical Commission. Every reference in the book involves a “redirection” of this kind from page reference to source. Faszination eines Trugbildes lies uneasily between an academic study and a handbook, but fails to convince as either. There are too many references and abrupt changes of theme and writer for this long essay to remain cogent, yet there is too much lengthy philosophical discourse for it to serve as a handy, practical reference work. It is nevertheless a mine of new information about different writers, especially Scandinavian writers, who suffer from that obscurity which is liable to be the fate of those whose mother tongue is not known by many people. Not only does Kunnas write at length on Knut Hamsun, but also on much less-known writers from the North such as Sven Hedin, Loavi Paavolainen, Örnulf Tigerstedt, and Maila Talvio. The philosophical discourses in this book, as for example on Martin Heidegger, are intelligent and informative and largely free of retrospective value judgements. Nevertheless, the book fails to clearly define who qualifies for inclusion in the work and who does not. It seems that any reasonably well-known European author or philosopher whose most famous writing (practitioners of other arts, such as architecture or music, are not covered) appeared between 1918 and 1945, and who was in at least one respect sympathetic to either Italian Fascism or German National Socialism, qualifies. This ambitious study thus centers on the relationship between fascism, philosophy, and literature, and the attraction the fascist movements held for intellectuals, in the inter-war years. Its assessment of literature falls short, however, when compared to its assessment of political theory. Kunnas seems much more comfortable in the role of political commentator than literary critic. While he ably describes the manner in which particularly irrational or anti-rational thought easily morphs into fascism (and there are times when Leftists would approve of his analysis), he is not very convincing in showing the extent to which this is reflected in literature. Kunnas collects information like a magpie, and he offers a vast collection of quotations which he liberally scatters throughout the book. But while his assertions concerning views expressed didactically by writers in his study are supported by quotations from original texts, Kunnas much more rarely quotes from poetry or fictional works. He quotes at length from political statements by such writers as Pierre Drieu La Rochelle, Luigi Pirandello, and Henry de Montherlant, but hardly ventures into the world of their plays, poems, or novels. But isn’t it their creative work and not their political theses for which these writers are justly revered and remembered? Most of the writers studied here were firstly creative writers, although from reading this book one might be forgiven for supposing that they were mainly political theorists who used creative writing only as a welcome vehicle for their political ideas. The novelists and poets covered by Kunnas overlap with many writers who are frequently mentioned – typically with brief approval – in the publications of the European New Right. The European New Right is more inclined to praise writers for their political engagement than for their merits as writers. Indeed, their publications tend to highlight creative writers who happen to be broadly in the same political orbit without feeling it incumbent upon them to argue for their literary merits. But why should a Right-winger presume that D. H. Lawrence, for instance, is a “better” or less “decadent” writer than E. M. Forster only because Lawrence’s ideas are more in accord with his own? This is merely the usual Leftist bias in reverse. It is no different from the obtuseness of the novelist Patrick O’Brian, who once told this reviewer that he did not consider Drieu La Rochelle a serious writer because he had been a fascist, and that “nobody with anti-humanist views is capable of writing a good novel.” This attitude prevails in schools and university literature courses. Jean-Paul Sartre and Albert Camus are standard syllabus fare for French literature courses; Robert Brasillach and Drieu La Rochelle are not. Thus, the objective assessment of literary merit is sacrificed on the altar of political bias. Anyone looking in Faszination eines Trugbildes for praise or even a defense of the writers studied in it, either as exponents of a specific political point of view or as highly talented creative writers, will be disappointed. What Kunnas does is to go primarily to neglected writers and examine the specifically “fascist” aspects of their writing while ignoring the rest – not with a view toward condemning or praising them, but to examine the correspondence between their own beliefs and the tenets of fascism. It can even be argued that by doing so, Kunnas is providing supportive evidence to those who wish to keep the likes of Brasillach and Drieu La Rochelle off the academic syllabi. Some of the quotations provided make the intellectuals cited sound very extravagant. Their words have not been taken out of context in an obvious sense, but the quotations mainly come from writings penned with a sense of urgency spurred by the approaching war, in which intellectuals felt compelled to take sides. But most of the writers presented are remembered primarily for their literary achievements, not for their political statements of faith. If Kunnas wrote a comparable study of intellectuals and the “Communist temptation,” would he comment at length on J. B. Priestley’s statements in praise of Stalin while ignoring Time and the Conways? Would he raise his critical eyebrows at George Bernard Shaw’s suggestion that certain criminals be put to sleep in their beds at a time of the state’s choosing, in a study in which he hardly mentioned St. Joan or Pygmalion? 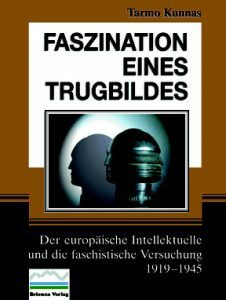 What is common in the “fascist temptation” which links the many European intellectuals and writers studied in this book? In a chapter entitled “Compensating for the Versailles Treaty of Disgrace,” Kunnas refers (pp. 73-74) to Armin Mohler’s well-known Die Konservative Revolution in Deutschland, which Mohler himself described as a “handbook of German conservatism between 1918 and 1933,” a work which may have given Kunnas the idea for writing Faszination eines Trugbildes. Mohler identified five groups or tendencies in German conservatism, which embraced lovers of nature and futurists, Christians and pagans, staunch conservatives and “National Bolsheviks” in their entirety. Mohler identified characteristics common to what were in many respects contradictory and rival currents: a positive notion of homeland, a dismissal (or at the very least distrust) of parliamentarianism, and a rejection of the rule of lucre; and he might have added what I would take to be a key element for any writer remotely sympathetic to fascism: a denunciation of decadence. These (including a sense that society is in decline or has become decadent) are the points of departure in Kunnas’ work, and to these may be added many subjects treated chapter by chapter, among which the tendencies which Kunnas views as being the most important for disposing an intellectual toward fascism are puritanism, aesthetics, and a willingness to sacrifice oneself for a higher end beyond oneself. Kunnas is good at highlighting contradictions and paradoxes which abound in fascist theory. How does an avowed Roman Catholic like Giovanni Papini, for example, reconcile his religious faith with the evident amoralism and ruthlessness of the militaristic foreign policy enacted by the Fascist government which he so ardently supported? By way of answer, according to Kunnas (p. 358), Papini’s early work Il tragico quotidiano (The Daily Tragic) accepts the notion that evil is a necessary part of God’s creation, and that without sin, there could be no poets, artists, or philosophers; indeed, no leaders of a people and no heroes. Vice may be the necessary condition of virtue, and evil may need to exist in order for good to do so likewise. Kunnas does not go far down the thorny and well-trodden theological path of speculation which he opens here. However, he is well aware of this and other conundra and contradictions within fascist thought, including in the writings of those intellectuals who were attracted by fascism, especially the notion that the warring poles of good and evil, war and peace, and pain and pleasure constitute the very fabric of life. Kunnas quotes many passages from these writers in which they proclaim their distrust or even outright rejection of rationalism. The lodestar here is Nietzsche, whose rejection of God and declaration of an ethic “beyond good and evil” provides the fertile ground out of which various projections of anti-rational faith have sprung. Another glaring contradiction here is between the anti-rationalist justification of emotions such as patriotism and the positivism which is at the heart of the case for racial differences, which humanist thought all over the world dismisses out of the deeply irrational rejection of the possibility that races are fundamentally different. On the whole, however, Kunnas does not spend much time or effort on differences within fascist thought, and this is a major weakness of his study. He hardly examines at all the gulf which separates those who believe in God from those who seek a return to the pagan gods, as well as those who believe in no gods at all but who hold that life is absurd, or else that force is proof of worthiness. All these aspects are examined in this work, but they are not positioned against one another. Kunnas does not seem interested in doing more than noting the wide-ranging views on such subjects among those he studies. For example, there is no discussion or contrasting of intellectuals who were drawn to fascism for conservative or Christian rationales such as Alphonse de Chateaubriant, who welcomed Fascism as the means to restore the old order, and those like Marinetti, who were sympathetic to Fascism for the exact opposite reason: Fascism as the means to destroy the old order. In scarcely one of the scores of examples and citations Kunnas provides would I take specific issue with what is stated, but I do wonder if Kunnas can see the ideological wood for all the thematic trees he painstakingly examines. Sporadically, another Céline appears to the hard and amoral one, a Céline mellow and humane, even when he conceals this behind caricature, exaggeration, and mask. Drieu did not have any such compensatory personality, but he did have aristocratic magnanimity and pride, which can also be found in another form in Henry de Montherlant. This study casts its net too wide. It seeks to be a reference work, a collection of essays on fascist writers providing a broad outline of the relation of fascism to certain strands of artistic and intellectual thought. It partially succeeds in all these aims, but wholly succeeds in none of them. This implicitly critical assessment of Johst’s position on race (a position which can hardly be characterized as exclusively National Socialist) strongly suggests that Kunnas himself does not believe in the existence of biologically distinct human races. Who can say? Since his work is conceived as an objective academic examination of a trend, Kunnas is able to evade the responsibility of taking a position on the subject himself. But at least we can be grateful that this work is no hatchet job. Any writer undertaking this task who works for a living in the halls of academia, or who enjoys power and prestige in the West, would have been obliged to issue intermittent anathema throughout the book upon these naïve victims of the fascist Comus in order to ensure readers and publishers that he was not for a moment seduced by the subjects of his study. Had Faszination eines Trugbildes been published by a mainstream or academic publisher, it would have required drastic “revising” in order to slant the entire work to read as a cautionary exercise. Fortunately, it is free of sermonizing. By noting many contradictions and differences among his writers, Kunnas implicitly accepts that the term “fascist” defies adequate definition. Although most fascist thinkers share most points of view on a given array of topics, no fascists share the same point of view on any one topic. Most fascists accept the necessity of struggle, and by extension, that war is an inherent facet of life, and on this basis they will accuse pacifists of “naïvety,” but even here there is not unanimity: Henry Williamson was undoubtedly a pacifist, as Sir Oswald Mosley professed to be on the basis of his experiences in the trenches; and Céline’s Journey to the End of the Night famously ridicules war. There is a paradox, if not hypocrisy, here: While fascist writers criticize war when carried out by democracies or in the name of democracy, most of them praise what they see as the sacrifice and creative nobility of war. Dulce et decorum est pro patriae mori? Wilfried Owen did not think so, and Ezra Pound echoed anti-war sentiments in his own poetry, although Pound, unlike Owen, had never risked his life in combat. All the failings of this book notwithstanding, it would be ungracious not to acknowledge the huge amount of work which Kunnas has put into this sweeping account of the views of scores of writers. I know of no other single work which comes near to capturing and quoting so many fascist or fascist-inclined writers. However, I was nevertheless dissatisfied. I found myself all the time wanting to return to primary sources as opposed to being presented with “bleeding chunks” of essays, novels, and poems. Besides, I find the creative writing of a Drieu La Rochelle or Henry de Montherlant more interesting than their political essays, and as I have mentioned, this book is weighted heavily in favor of theoretical over fictional writing, particularly so far as quotations are concerned. Of course, it is considerably easier to measure theoretical or even philosophical writings against fascist preoccupations than it is to measure creative works against them. In the case of fiction or poetry, it is easy to overlook that what may have been fascist preoccupations were common themes and preoccupations of the time as a whole. For example, the ideal of Blut und Boden (blood and soil), which is so strongly associated with National Socialism, was in fact coined in Oswald Spengler’s The Decline of the West as an ideological rallying cry in opposition to Blut und Eisen (blood and iron). It was a strong theme in much European fiction, and not necessarily of writers “tempted by fascism” at all. Yes, the Mother of God, the Mother of God who made Man. God who created, who suffered in his creation, who dies and is reborn. I shall always be heretical. The gods who die and are reborn: Dionysus, Christ. Nothing is created but through blood. There must be ceaseless dying for ceaseless rebirth. The Christ of the cathedrals, the great god white and virile. A king son of a king. He found a rifle, went to the loophole, and began to shoot, with application. Kunnas’ work will hopefully serve as an inspiration to his readers to find or return to the primary sources and read them, or reread them, better equipped with the knowledge of the extent of the writer’s dallying or commitment to those movements whose shattering defeat in 1945 continues to cast a shadow over the politics of the entire world.